The surprisingly must-see horror film of the year is here, and it’s The Shallows. Last year, that honor went to It Follows, which hopefully sparked a movement toward simplistic horror filmmaking, leaving the ghosts behind & focusing on the pure terror of death. Well, if you’re looking for death, look no further than this blood-in-the-water fright fest, and just in time for your trip to the beach too. If you watched the trailer back in April, you could see that there was a possibility of something special here, though I doubt anyone expected just how well this film would be received when it was released. But it’s quickly becoming something that anyone who wants to be scared must check out, as well as something critics need to weigh in on. 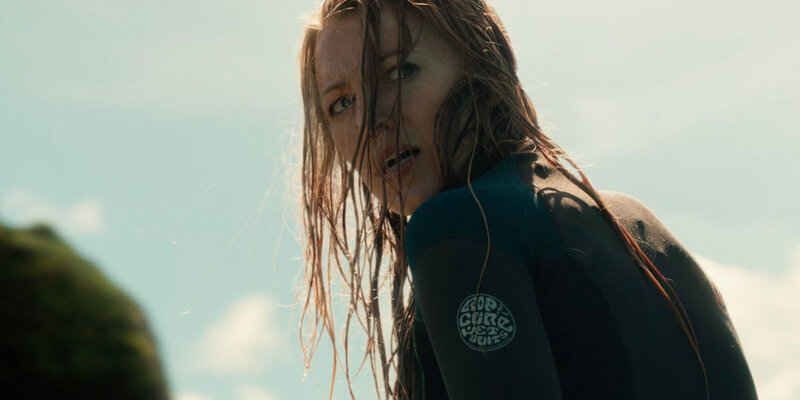 The Shallows is a legitimate contender for perhaps not breakout film of the year, since we know both Collet-Serra & Lively, but at the very least the summer shocker that you can’t miss. To escape from the pressure of her mother’s death, her father’s heavy hand, and the stress of med school, perfectionist Nancy takes an extended Spring Break, heading to Mexico with a friend to discover a secret beach that has an emotional connection to she & her mother. A surfer as well as a doctor-to-be, Nancy hits the waves of an idyllic lagoon on one perfect day, looking to find a peace that has been missing for far too long. But what she finds there is anything but peaceful, rather the deadliest encounter of her life. The body of a whale has become stagnated just over the crest line, attracting a massive shark, an animal unheard of in this area. Attacked by the shark in defense of its new feeding ground, Nancy is injured & marooned on a rock, bleeding and counting down the hours until high tide returns. It’s man vs nature in this struggle for survival, with only one combatant set to make it out alive. With many homages to Jaws and a knowing nod to Shark Week fans everywhere, The Shallows delivers on all levels as an exhilarating, gory, exciting, frightening horror flick that deserves all the attention it never expected but definitely deserves. From the very beginning to a quick end (the film is only about an hour & fifteen minutes long), the intensity of that beach never slows, even in the peaceful moments there’s a sense of dread in the mood & the music that makes your hair stand on end. The action woven within the quieter moments is intense & devastating, making even the most comfortable in the water rethink their next swim out to the sandbar. It’s horror on a higher level and should earn credit for its raw power as well as its cinematography, each beach shot beautiful, each underwater scene drowning in blood & terror. And speaking of beautiful shots, look no further than the star, Blake Lively. Extra attention was paid to her assets at the beginning, only to tear them apart on the rocks & on the teeth of a monster, an intentional shock in which the joke is on us. Director Collet-Serra (Non-Stop, Run All Night) knows what he’s doing, knows how to play with the most basic parts of us and force them to work in his favor. He did borrow from Jaws a good deal, and even perhaps Gravity in a weird way, creating a Soul Surfer vibe with an adult twist. He even added in a bird friend to lighten the mood, following the formula of Shakespeare himself, adding a dash of humor to the most tragic moments to keep audiences from giving in to the despair. I could have done with a little less backstory, a little less message, because the action spoke for itself, and loudly. But overall, The Shallows is what I wanted though never actually thought I would get.